We started this to keep our family and friends updated with what we're doing and what's new. We've gone from Melbourne, FL to Mountain View, CA to Yardley, PA to Sunnyvale, CA and we're not done yet! On Friday night, Jonathan, Rob, and I drove down to Philadelphia for some good sushi. 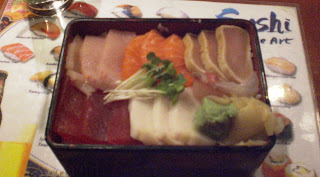 Jonathan had gotten some great recommendations about a place called Vic's Sushi. It had great reviews on yelp, and we were prepared for a tiny place with fresh fish and great prices. We found it pretty easily, but parking was a bit difficult. When we got inside, we were told it was a 20-25 minute wait (there are only about ten seats), and we were welcome to walk around. So we did. We found a Qdoba, and since that's our favorite chain Mexican, the three of us ducked in and split a chicken quesadilla as an appetizer. We arrived back at Vic's exactly 25 minutes after our first time in there... and continued to wait. After another twenty minutes (nobody was seated at all during this time, and it was clear we were next... eventually), we just left. It was coming up on nine o'clock and we were hungry. We walked around the block and found Fuji Mountain Japanese Restaurant a block over. The sushi bar up front looked empty, so we waltzed in. Turns out it's Restaurant Week in Philadelphia, so many of the popular places are reservation-only... including this place. They were willing to seat us at the sushi bar, so that's what we did. The menu was pretty extensive, and we made our selections quickly. Jonathan and Rob each ordered combination platters... Jonathan had sushi (nigiri) and maki (rolls), and Rob had an assortment of sushi. I went with a chirashi dish, also known as a lot of fish on a bed of rice. It's a favorite of mine, generally speaking. And with 16 pieces of fish for $23, it's a steal. All of our meals came with soup and salad... the soup was average miso, the salad was slightly above average. But we all loved our entrees. 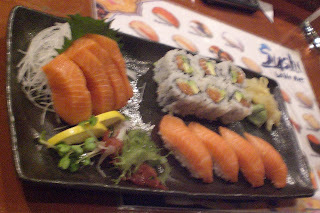 The fish was fabulous, particularly the salmon and the white tuna. I was unable to identify one of my pieces (the small white piece just above the ginger in the photo), as it was nothing like I had ever had before. I'm inclined to say it was an octopus or other mollusk, but I really don't know. We were all impressed with the place, and would come back if we were in the Rittenhouse Square area of Philly again. I might suggest a weeknight instead tho, to alleviate parking trouble. Oh, and something neat about the place... it was quite a few floors, with two rooms devoted to karaoke parties. We were allowed to tour one of the rooms (the other was in use that evening), and it had enough sofa seating for twenty, with menus and tables and a karaoke machine. Awesome. The only slight drawback would be that the karaoke songbook was half in English and half in Japanese, so it was difficult to figure out how to follow the order in the few seconds I glanced through the pages. Awesome Inc. theme. Theme images by kickers. Powered by Blogger.